Janice Cole - St. Louis Equity Fund, Inc.
Janice Cole joined the St. Louis Equity Fund in April 2018 as Administrative Assistant. She is responsible for providing confidential administrative support for the staff, day-to-day telephone communications, meeting preparation, directing visitors, and ordering supplies. 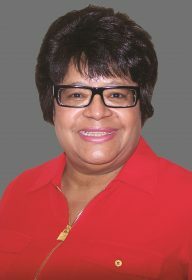 Prior to joining St. Louis Equity Fund, Janice worked for Washington University Medical School for 28 years serving in the Departments of Microbiology, Genetics, Biomedical Computing and the Division of Child and Adolescent Psychiatry steadily increasingly in position from Secretary II to Administrative Coordinator. She was instrumental in incorporating donations to “The Shoe Man” as a member of Washington University School of Medicine Sustainability Action Team Committee. She has held numerous secretarial positions at People’s Health Center, St. Louis Housing Authority, City of St. Louis Lead Control Division, St. Louis Hearing and Speech Center and Harvard Interiors Manufacturing Company, all located in metropolitan St. Louis, MO. Janice has served as a consultant for the Junior Achievement Award Program, “The Economics of Staying in School” (1996-2000), Board Member for the St. Louis Junior Academy Elementary School (1987-1989), Board Member, secretary and primary teacher for the Agape Seventh-day Adventist Church (1982-present). As a volunteer, Janice assists in local and national church missions under the Adventist Community Services (ACS) and Adventist Development and Relief Agency (ADRA) ministries, including travel to the Josiah Bethany Orphanage in Reynosa, Mexico and occasional missions to “Wounded Knee” at the Lakota Pine Ridge Indian Reservation in South Dakota.